Caption: From left, CEO of Dairymaster, Dr Edmond Harty, John Molloy, Minister for Agriculture, Michael Creed, Áine Butler, and programme leader for the BSc (Hons) in Agricultural Science, Dr Michael Breen. WIT BSc (Hons) in Agricultural Science graduates John Molloy and Aine Butler were the recipients of the inaugural Dairymaster Agricultural Science award at the Ploughing Championships in Screggan, Co. Offaly this year. The award recognised the achievements of Agricultural Science degree students with the best final year project presentation, and was judged by a panel of experts from Dairymaster, Teagasc and WIT. 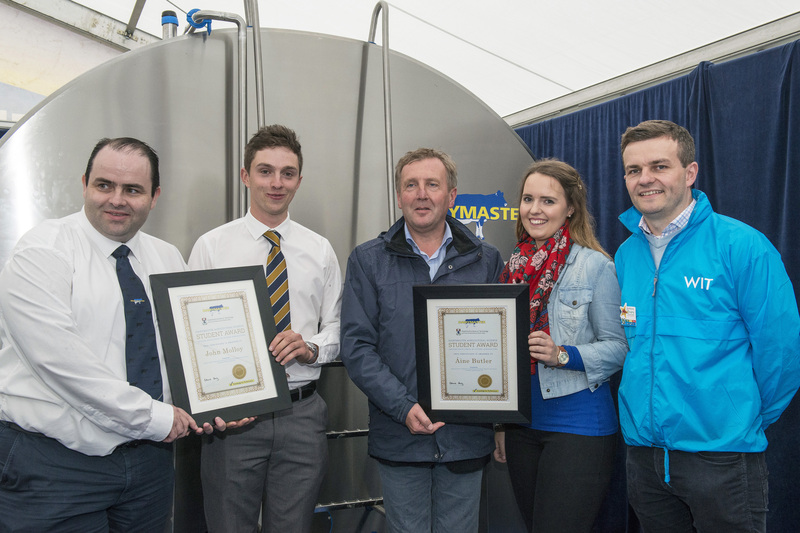 Both John and Aine were presented with a certificate at the Dairymaster stand at the Ploughing Championships by the Minister for Agriculture, Michael Creed and CEO of Dairymaster, Dr Edmond Harty. Since completing his agricultural science degree at WIT and finishing his thesis titled, “The effects of body condition score and energy balance on the milk fatty acid profile of lactating dairy cows”, John has found employment with Agri-Lloyd which supplies innovation and nutrition inspired products to livestock farmers. Also in attendance was programme leader for the BSc (Hons) in Agricultural Science, Dr Michael Breen, who commended both Dairymaster and Minister Creed for their part in the event. WIT’s agricultural lecturers joined outreach officers over the three days of Ploughing to discuss everything from courses to careers, the state of farming today and how to plant the seed packs WIT was handing out.